breathtaking scenery. Vermont is....quaint towns with cozy inns. Vermont is... world renowned chefs and exquisite resorts with pampering spas. Whether exchanging vows in a field of wild flowers, traveling down a country road in a horse-drawn sleigh on freshly fallen snow, or sitting by candlelight in a 19th century barn, the Vermont list of wedding venues will help you plan every step of your Vermont wedding. Come visit us in Pittsfield, Vermont where you could schedule visits at multiple wedding venues on the same day. We will be honored to take you on a wedding tour of the Amee farm, Riverside farm, or any of the exquisite wedding venues located throughout Vermont. 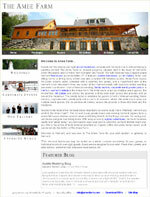 We've created an easy to use directory to help assist you with your Vermont wedding. This site contains many great resources to make the wedding planning process as easy as can be. Make sure to check out our featured Vermont wedding vendors that have been selected by our users! Signing up is quick, free and instant. Once you're member, you're company will have its own ad that potential clients can easily find. Thanks for checking out Vermont's Best Online Wedding Directory! Here is a fun article on our featured Vermont wedding venue and why it is such a sought after and hard to get into location. SoYouWanna Have a Wedding at Riverside Farms? Have in Common? Take a look! Get engaged and start the fun! Create a budget. A Vermont wedding can be as affordable or as extravagant as you would like. Create a vision, is your dream wedding in a barn? On a farm? On a lake? Vermont is filled with options. 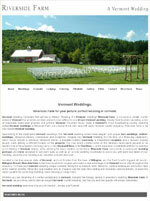 Choose a Vermont wedding planner or plan it yourself! Some venues provide planners but planning it yourself can also be fun. Choose a caterer, farm fresh Vermont foods are available all over Vermont. Choose a florist and a photographer. Many florists and photographers can help create more than flower arrangements and pictures. The right Vermont florist and photographer can create your entire wedding atmosphere. Pick your music or band, there are incredible music options in Vermont. Decide your parties dress. Remember many of you will only wear this once! Have fun...it is not just about your guests, it is your day and have fun too..